No young girl who ever has longed to know the mystery of the world behind the footlights will be able to put down this new story about Penny Parrish and her first exciting experiences on Broadway. After working hard all summer in a stock company, Penny finds herself in the cast of the show, The Robin's Nest, due to open on Broadway. There she meets Josh Macdonald, the blunt, weary-looking stage manager, who takes a keen interest in her success as an actress--although he is surprisingly indifferent to her as an attractive young girl! Making a flying trip home between rehearsals, Penny meets an earlier admirer, Lieutenant Terry Hayes. Terry introduces her to a very beautiful young woman, also on her way to Fort Knox. Penny immediately distrusts her, and a thrilling spy hunt develops. As the story progresses, Penny learns the answers to all the things a stage-struck girl wants to know--what actors are like after working hours, how to thwart someone who is trying steal your best scenes, how feels to wait for the curtain to go up on opening night. 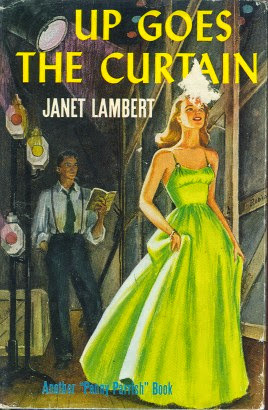 Up Goes the Curtain begins with Penny Parrish alone in New York, preparing for her role in a Broadway play (The Robin's Nest) and missing her family at Fort Knox. She finds a confidante in soda fountain waitress Letty whose husband is overseas. "There was nothing she enjoyed so much as talking with people; not to them, about them, but with them. She forgot she was homesick, forgot to drink her coke, but sat with her elbow on the porcelain counter, her soft round chin cupped in the palm of her hand, listening to the story of Joe and a girl he called Letty." As Penny talks about her own family, Lambert gracefully catches us up on the doings of the Parrish clan. Letty inspires her to go visit her family until the show start rehearsals. In a coincidence, Terry Hayes, one of Penny's most ardent suitors, is also heading to Fort Knox, but seems surprisingly cold on the phone. She sees him on the train as well, and he is with a beautiful young woman named Marcia. She puts him out of her mind, and gets absorbed in her script and her new role in the play. "'Oh me,' she sighed at last, flipping off the light and snuggling down under the heavy Pullman blanket, 'I do lead the most divine life. I guess I'll lie here and think about it awhile.'" Despite Terry's confusing behavior, Penny soon has a very joyful reunion with her family, including Carrol and David, who have a chat about Penny and Terry. Because Carrol is a "mum little oyster", David tells her that Terry is working in intelligence and suspicious of Marcia. They can't tell Penny, though, she can't keep a secret. And is Penny ever suspicious! Finally, Carrol has to give her some news to throw her off the track: "'I didn't mention it before, but David and I have put in our order for a very special baby.'" This doesn't dissuade Penny for long, who is deeply suspicious of both David and Terry's attentions to Marcia. Soon, she's spying and even intercepting a note left in a glove handed to Marcia by a soldier. She reads it, thinking it's merely a love note, and terribly regretful, she goes in to her parents' room to confess, but Major Parrish has news for her: she was right. The note contained very sensitive information about maneuvers, and Penny "thought excitedly, 'I'm helping. I'm helping my country. And perhaps I've saved David's ship from a submarine so he can come back to see his baby.'" Marcia and the soldiers and officers are arrested, and soon Terry Hayes comes calling, and Trudy lets Penny know he's arrived. 'Do he look mad, holdin' a box that's gotta be candy in one hand an' one that's gotta be flowers in the other?' Trudy enjoyed the pleased embarrassment that spread over Penny's face, and added slyly, 'He's courtin', honey.'" 'So that's the way it is.' Terry's jaw tightened and Penny saw a little ripple of muscles run along it. 'I suppose I should have known,' he said, his blue eyes steady on her upraised brown ones." "She wriggled to get free, then, still in the circle of his arms, reached up to take his cheeks between her hands. 'You know, don't you, that I want you to be the one I love someday?' she asked, so childishly sincere that he knew love hadn't yet come to Penny." Major Parrish and David are shipped out, and Carrol returns to New York (and the swanky Park Avenue apartment) with Penny. They find Letty again and invite her to dinner, where she and Carrol become fast friends. Before we know it, it's the day of the first rehearsal for The Robin's Nest. (Can you believe we're only halfway through this book? It really is jam-packed!) Penny puts on her tan suit and her plaid topcoat and heads out. "She felt very important walking along Broadway and turning into Forty-Fourth Street with its double row of theaters. She even walked along a narrow alley with her head high, proud to be one who had a right to drop out of the throng of pedestrians and traverse its narrow runway." "hobbling along the alley, when the dark, dejected stage manager passed her without notice. He walked with an irritated lunge and she wondered why he wasn't in uniform. Miltern Wilde had frankly explained a punctured ear drum, but Josh MacDonald, for all his pale leanness, looked healthy and cross enough to frighten a Jap or German out of his fox hole." Rehearsals continue, and most everything is going well, except a fellow actor who is trying to upstage her. Oh, and Josh seems really unpatriotic and dismissive of Penny's love for her country. Soon, Penny is on the train for opening night in Boston, which the attentive Terry is attending as well. The cast has some jitters. "Only Penny stood calmly in the wings awaiting her entrance, and just before she was to go on, Mrs. Kerston upset her equilibrium by telling her she was too young in the business to know how frightened she should be on opening night. After that she proved herself an actress by going to pieces with the others when she was off the stage and by working coolly and intelligently when she was on." "'I was so mad to be doing for fifty bucks a month what I'd been paid a thousand for, my nerves blew up. They flew in all directions like a busted light bulb.'" He was silent and walking again, and Penny ran a few steps to keep up with him. 'Josh,' she begged, 'let me make the army mean something to you. I've spent all my life in it and I love it. Give me the chance to prove to you how fair it can be. Don't let the whole be ruined by the bit you saw. Please, Josh.'" And he does. The play is going beautifully, Letty has moved in with Carrol and Penny, and all is going well. One day, Penny calls home to find out that Carrol has gone "to the hospital, of course, to get the baby." Soon, Davy is born, and Penny brings Josh out to the family estate to visit. She learns more about Josh's sad and lonely past and they start to make plans when a phone call comes that announces that Michael Drayton (another of Penny's suitors)'s plane has gone down and he is missing. Penny starts to fall apart but Josh gives her a little tough love, reminding her that she has a show and cannot go to pieces. "Lights were glowing along the Hendrik Hudson drive when they entered New York, with windows of tall buildings twinkling like diamonds in the dusk, and he leaned over to look at them. 'New York,' he breathed. 'The greatest living city in the world. Take a look, Penny; it's all yours if you want it." Penny wonders if she does and the book ends on a melancholy note as she prepares for her play. This book has everything: tons of romantic intrigue as well as army intrigue, and spies; plus, a fascinating look at backstage at a Broadway show, through the eyes of Penny. We see Letty and Carrol being strong and building up courage in their husbands' absences, and Penny start to learn what she might want in life--and it might not be the army. It's a perfectly marvelous book, and one of my very favorites.